Learning the value of value: light and darks. 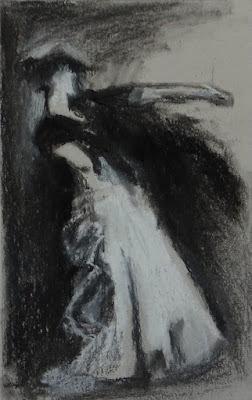 The focus of this lesson was using toned paper and charcoal to suggest a woman dancing. The reference photo was a Singer Sargent painting called "Spanish Dancer." Using a blocking method and a few strong strokes, it was easy to see an image beginning and the balance of the light and dark that made his painting so powerful.